CALGARY, AB. – As Puerto Escondido in Oaxaca, Mexico continues its rise as a world class tourist destination, Vivo Resorts, an established luxury oceanfront resort founded by Canadian Olympian and former World Cup Downhill Champion Cary Mullen, is rising with it. Puerto Escondido was covered recently by Major news outlets such as the Financial Times, CNN Travel, and Toronto Sun, all running stories about Puerto Escondido’s off the beaten path charm and its emergence as a travel destination for those looking for locations that are not purpose built for tourism. Since the first traffic lights were installed in 2005, Puerto Escondido has experienced dramatic growth. Its population has more than doubled to reach 45,000 with critical infrastructure, including the new hospital, growing to support its residents and visitors. Vivo Resorts’ rise is in parallel with Puerto Escondido’s emergence as a world class destination for savvy travelers, the international surfing crowd and those wishing to experience authentic Oaxacan culture and cuisine. Since the first power lines were connected in 2010 the resort has been gaining momentum year over year, and the gated 75 acre Vivo Resorts is well positioned to fulfill its ambitious master development plan. It features 10 of a planned 114 private homes along with 130 of a planned 400+ condominiums with plans to add a commercial shopping area. Another 70 condominiums are already mid-construction, with the release of another tower expected in the coming weeks. Vivo Resorts offers its owners unpretentious luxury and its $7 million Clubhouse is the centerpiece and social hub for a resort that also feels like a community. At 53,000 sq ft, the clubhouse features luxurious amenities including a relaxing spa, ocean view fitness facility, upscale restaurant, sports bar, tennis courts and large event space. 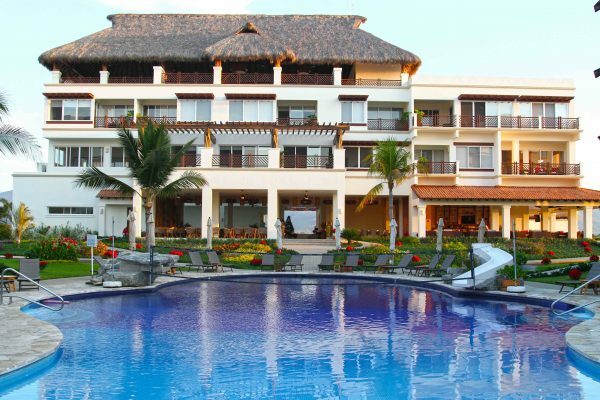 Vivo Resorts is located on a 21 km stretch of pristine and untouched beach just outside of Puerto Escondido. The location was selected by founder Cary Mullen after reviewing 30 different destinations based on 44 different attributes. The region is known for its off the beaten path appeal, internationally recognized local farm-to-table cuisine, and weather. The climate is consistently warm with low rainfall and low risk of hurricane. Warm-at-first-touch water temperatures make the area perfect for swimming, stand-up paddling, scuba-diving and snorkeling year-round. Puerto Escondido is also a top international surfing destination and hosts surfers from around the world. Vivo also offers a wide variety of land based activities including biking, hiking, eco-tours and horseback riding. Vivo resorts operates on a non-speculative, non-leveraged business model. Funding is secured by buyer deposits and when pre-sales target are realized, construction begins. No debt means no financing costs, no debt payments and no insolvency risk. Early Investors in Vivo are already seeing gains. In 2010, the first 1 bed, 1 bath condominiums were listed at $158,000 USD. In 2015, similar 1 bedroom suites were listed at $214,000 USD and are now listed at $339,900 USD. Vivo Resorts caters to buyers with multiple styles, sizes and prices of condominiums. For those who want a waterfront experience, every suite in the Marino and Nautico buildings offer panoramic, unobstructed, wide-angle ocean views. Both buildings offer one, two and three bedroom configurations ranging from $339,000 – $624,900 USD. For those who prefer to lounge by the pool and enjoy lush gardens, Botanica residences offer one and two bedroom configurations and range from $232,900 – $299,900 USD. All Resort condominiums feature floor to ceiling glass patio doors that maximize ocean and/or mountain views. Investors seeking a more luxurious experience can choose from a number of different pre-designed private villa configurations or build a custom villa starting at $200 USD / sq. ft. Pre-designed options range from $282,600 for a 1,550 sq. ft two bed, two bath home to a four bed, four bath home for $989,900 USD plus the cost of home site.